Fairport, NY: Saelig Company, Inc. has launched the new EQHJ Series Oscillators designed by frequency control specialist Euroquartz, offering ultra-low phase jitter. The new oscillators provide a precision LVCMOS output from a supply voltage of 1.8, 2.5 or 3.3V. The new EQHJ series oscillators deliver frequency stability from ±25ppm over the whole industrial temperature range of −40 to +85 °C. 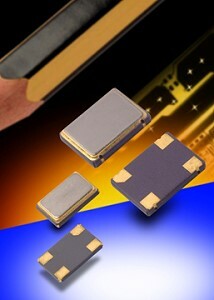 Three industry standard surface mount packages are available - 7.0 x 5.0 x 1.4 mm, 5.0 x 3.2 x 1.2 mm and 3.2 x 2.5 x 1.0 mm. Current consumption ranges from 3 mA typical (5 mA max.) for the smallest package size to 7 mA typical (10 mA max.) for the largest devices. The EQHJ series oscillators are available in the frequency range 5.0 to 50 MHz. Additional specifications include 15 pF load (CMOS), start-up time of 0.8 ms typical, 5.0ms maximum and duty cycle of 50% ±5% (measured at 50% VDD). Typical rise times are 5.0 ns for smallest size, down to 1.5 ns for largest package, with 10ns maximum across all sizes. Aging is ±3 ppm for first year and ±2ppm per year thereafter (at 25°C). Phase noise specifications are 48 fs typical at 3.3 VDD and 118 fs typical at 1.8VDD. Designed for use in applications that require ultra-low phase noise - such as flat panel displays for consumer TVs, video streaming systems via external cables (e.g. LDI), high speed serial communications links such as Serial ATA & FireWire, SONET, xDSL, SDH, set-top box and Ethernet cards, the EQHJ series of oscillators is available now. The EQHJ series oscillators are made by European frequency product specialist Euroquartz, an independent UK-based manufacturer and supplier of quartz crystals, oscillators, filters and frequency-related products to the worldwide electronics industry. The company is AS9100 registered and designs and manufactures a comprehensive range of frequency control components for a wide range of customers for military and aerospace, communications, general electronics, computing, control systems and petrochemical applications. The EQHJ series high reliability oscillators are available now from Euroquartz' USA distributor Saelig Company, Inc.
See Saelig's Euroquartz press release here.